Kazuharu's chief maid. She is even stronger than Kirie, having fought in military operations in Bosnia, Somalia, Chechnya and Afghanistan. Lilica is highly intelligent and is often seen with a laptop, which serves various purposes, such as operating the mechanical devices within the Fukuyama mansion and deploying surveillance software from a spy satellite orbiting earth. (This is how Fukuyama constantly finds Koyomi and the others.) 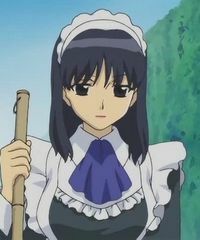 In the anime, Lilica took on Mamoru Machida as an apprentice after being impressed by his desire to protect the world from grime and dirt. She is also occasionally hinted to be in love with Fukuyama.